When Kinect launched for the Xbox 360 in the holiday of 2010 there were some interesting potential buys for people looking to spiff up their aging console. Refreshingly new experiences for any system after five years on the market tends to be difficult to come by. In order to consistently battle for the top spot of the charts, like the 360 has done for the last few years, you need to have a constant stream of content. That content needs to have unique, fun and fresh experiences. Kinect has done just that for Microsoft. Of course with titles like Kinect Sports, Dance Central and Child of Eden helping to attract millions of new gamers to the Xbox 360. There are those that would love to cash-in on that excitement as well. MotionSports from Ubisoft is one of those cash-in titles. Soccer was the most enjoyable to play. I believe the main reason for me enjoying it was that it worked 80% of the time. For this game I bent over to set the ball on the ground and then had to step back away from the “ball” to increase my “power meter”. The farther back I was the stronger my shot would be. When I ran forward however the camera would have difficulty registering if I was kicking the ball. Meaning multiple tries were needed to get the kick off. What I found that worked most of the time was dragging my foot on the floor. This ended up shorting my time with soccer, because my foot started burning. I attempted different methods, but the game wouldn't register anything else. Now for the game part there are five rounds. Each round consists of both the player and the AI opponent taking turns shooting the ball at the goal. With me having to drag my foot on the floor to get the shots to register I sucked at aiming. The better I perform in the game I unlock more events. Unfortunately, I was able to get only one thing to unlock before giving up on this game and that was another boxing opponent. Horseback Riding is the poster child of how this game just doesn't work like it is suppose to. When attempting to play this sporting event, I had to lean forward and move my arms out to my sides. While also keeping my hands slightly in front of me as if I was holding reins attached to my horse. Keeping this position throughout the event didn't appear to be a problem at first. Until I added moving to the equation though. The thought of there being no problems quickly faded away once it became clear that the Kinect struggled to process my movement. This was the most frustrating part of MotionSports. I was standing there flapping my arms like a chicken and nothing was happening in the game itself. Excluding my poor avatar flailing his arms around just like mine in real life. Which means Motion Sports had to have been recognizing my every movement, but just decided not to implement them. When I managed to get the horse moving I noticed a lag between when I actually jumped and when the horse jumps. This wouldn't have been that big of an issue if the horse could just turn around and try again. But, here is the dilemma: the way you turn around is to stand straight up, lean and stretch your left/right arm all the way out to the side. By doing so causes the horse to turn in the direction I was leaning in. Turning while running is not an option either. Because the moment you stand or extend your arms out, the horse stops. So, there I was finally moving, managing to jump over the first obstacle, the game however didn't register that I made the jump, so I tried to turn around, the horse ran into the wall forcing it to completely stop, while I was against the wall my horse was having trouble turning around because it kept hitting the wall, which was making it stop, all I was trying to do was get it to turn, here revealed another problem. I needed to get my horse to go forward (facing the wall), so I could get myself away from the wall, so I could turn my horse's body, so we could start going again. All this just to line myself back up with the first obstacle and jump again. It is unbelievable that anything this broken could have made its way into the final version of the game. Next to horseback riding on the scale of broken would be boxing. This game didn't appear to have very many issues within the first fight. There were problems with the game recognizing anything other than jabs though. Once I unlocked the second opponent (by completing one round in football?) problems started popping up with everything. Much like the issues with horseback riding boxing struggled to function. For instance, whenever the opposing boxer goes down and the ref starts the count you're able to rest, there is also a break while you wait for the opposing fighter to get ready to go again. That break doesn't happen for you. On top of that the game doesn't recognize when you get your hands up after being downed. This means that your avatar's arms stay down while the opposing boxer starts hammering you. So the other boxer gets some time to recoup and you don't. This isn't the end of the problems either. There is the issue of having to throw roughly four punches just for the game to register one. With that being said though, the punch the game registered, might not actually be the punch you throw. Just so you know that. After about five attempts against this guy I finally beat him. Simply by just constantly punching. Of course he still downed me twice, but I beat him. 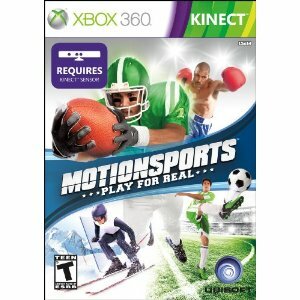 MotionSports is not the game to get when wanting to justify spending the money on the Kinect. If you're looking for a sports-mini game type of experience there are better games out there. Don't waste your time on this crap. The reason I didn't talk about hang gliding, skiing or football is due to me not getting that much time with them. I did play everything this game had to offer, but those three didn't have much to them and the ones I did talk about took up so much of the focus.